A R Rahman meets Randy Newman: At the 83rd Academy Awards held on Sunday night in the US, A R Rahman lost out in the Best Song category to the American composer Randy Newman. Many in India believe A R Rahman deserved the Oscar for this hauntingly melodious ‘If I Rise’ from 127 Hours, even though Randy Newman bagged the golden man for ‘We Belong Together’ from Toy Story 3. But there was no resentment on the part of Rahman who had beforehand stated that he did not hope to win this year. Rahman was also nominated for Best Original Score but lost out to Trent Reznor and Atticus Ross from ‘The Social Network’. Very sportingly, Rahman bonded with Newman at the show and later even posted a pic of him with the American composer on this Twitter page. 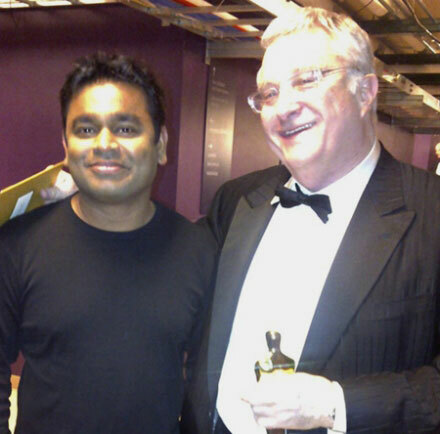 “With Randy Newman, who won the Oscar for Toy Story 3,” Rahman wrote and posted the pic below.